The stands at the Lifetime Activities Center are a little more than bare during the SLCC men’s and women’s basketball games. There are a few explanations for this trend, such as the varying ages of SLCC students, their busy lives outside of class, or they simply might not know when and where games are held. Gonzalez lives in Orem and says that he doesn’t have much time to attend basketball games. According to the Salt Lake Bruins website, the 2012-2013 men’s basketball team has a current record of 22-3. The women don’t trail too far behind with a record of 15-9. Even with these records, SLCC students don’t seem to have the time to attend the games outside of class. Others just don’t know enough about when and where the games are played. “I’ve never heard anything about when a game is, where it is, whose playing, or who’s on the team,” said student Lori Blood. Blood is a single-parent of four who doesn’t have much time for basketball games but would be more interested in attending if she knew more about it. Age is also a factor for low attendance at games. Many SLCC students are past the age when traditional students are interested in college events. They have jobs and families to provide for, and they just don’t have an interest in what goes on outside of class. Big universities have a younger population of students who attend basketball games. Most are right out of high school. When students are younger and live on or near campus, they are more likely to attend athletic events than students who live far away and commute to school every day. 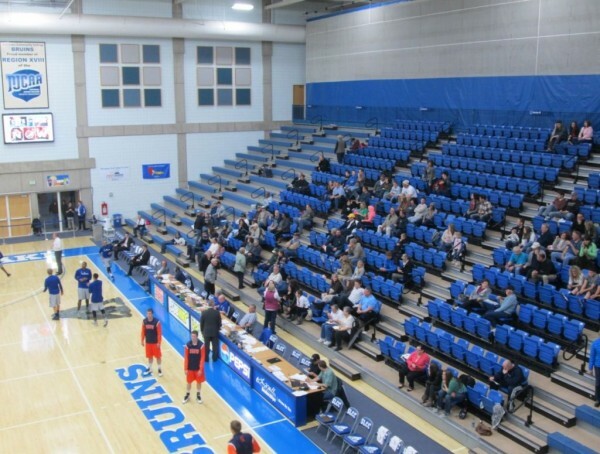 At the last basketball game against USU-Eastern, SLCC fans were scarce. A large portion of fans were parents of the players, while USU-Eastern had a whole fan section of students cheering on the team. Where are the Bruin fans?